Christmas is a time when most of us want to show our loved ones how much we care by giving presents. The stores are full of items that make good gifts, but sometimes it’s nice to give something that’s a little more personal. Creating home-made gift baskets is a thoughtful way to commemorate the holidays, and it can be much less expensive than buying things from the store. Here are some home-made gift ideas that are sure to please. * Christmas ornaments – There are lots of ways that you can make home-made Christmas ornaments. One of the simplest and least expensive is to bake them. Use flour and a pinch of salt, and add enough water to make a thick dough that will hold its shape. Roll it out flat, and cut shapes out using a knife or cookie cutters. Make a hole at the top to hang by, carve designs in it with a toothpick if you like, and bake at 250 degrees Fahrenheit for about 12 to 14 minutes. Paint with acrylic paint when cool. * Baked goods – Speaking of baking, everyone loves yummy homemade treats during the holidays! You can make them into a wonderful gift by presenting them in a festive tin. Some good candidates for gift giving include cookies, toasted nuts, candies, and brownies. I love cookies, do you? What is your favorite cookie recipe? * Clothing and accessories – If you can sew or knit, why not make your family clothing for Christmas? Nice, warm sweaters are always appreciated during the winter. Accessories such as hats and scarves are also appropriate for the season. If you don’t sew, there are even some accessories you can make out of fleece that do not require a single stitch. * Jewelry – Handmade jewelry makes a wonderful gift. You can make pieces using wire and gems or elastic and beads. Even if you’ve never made jewelry before, there are plenty of simple patterns to be found online and at your local craft store that virtually anyone can make. If you like to work with clay, you could also use that to make lovely pendants or earrings. * Spa Creations – There’s nothing quite like receiving a gift of indulgence and relaxation. 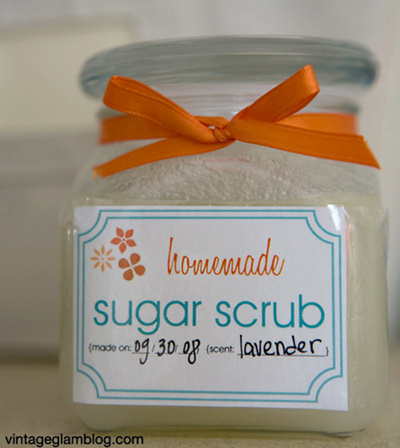 How about stirring up a Sugar Scrub such as the one from Elizabeth Anne Designs? You can do it! Making your own Christmas gifts can save you money, and it ensures that the items you give will be unique and memorable. If you start a few months beforehand, you can easily create something special for everyone on your list.